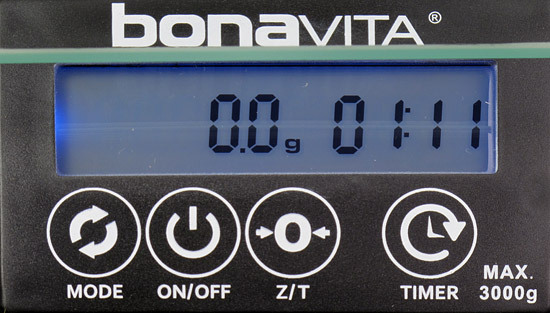 Sorry, we are currently sold out of 'Bonavita Electronic Scale'. Please check back later. The Bonavita Electronic Scale is perfect for pour over brewing, making it easy to use anything from a single cup filter cone to a Chemex brewer. But this scale will also be equally useful for weighing ground coffee for consistent brewing, or, for a host of other weighing needs such as baking. The water resistant scale comes equipped with a stainless steel finish and a tempered glass top as well as a removable drip tray to collect any spills. It weighs in ounces, grams, and pounds and can measure as precisely as .1 gram increments with a capacity of 6.6 pounds. The scale has a count up timer for timed brewing and complete precision. The timer has a terrific feature - it will not shut off automatically which makes the brewing process for any pour over method more convenient. The tare function is another vital feature for pour over brewing and allows you to weigh water and coffee with complete control. The scale is compatible with the Bonavita Dripper Stand (entirely assembly sold separately) to hold a filter cone of your choice. The stand is sturdy and adjustable by use of the "pinch grip" to move it to whichever height suits your needs, allowing enough room to fit both regular and travel size mugs. This set up is great for home use but also a convenient addition to any coffee store or restaurant.